Whether you are a hotel, casino, restaurant, or any public or private facility, there are always ways to improve your recycling program to make your facility “greener.” Here are five tips that are good for the environment and good for your bottom line. 1. Use items with recycled content and post-consumer recyclables in your facility. Upholding a higher “green” standard may be easier than you think. Use metal recycling receptacles made from recycled metals such as fire safe aluminum and galvanized steel and whose materials can be used again and again in new products re-manufactured decades later. The top recycling receptacle manufacturers (such as Glaro Inc.) use recycled content and ensure that recycling receptacles are 100% post consumer recyclable. 2. Use durable recycling products that last. Durability is an attractive feature if you would like to be eco-friendly because products that are built to last cost you less in the long run by saving significant energy required to continually replacing products. Replacing products requires more manufacturing, more energy, more labor, more byproducts, more shipping, more hydrocarbons, more waste, and ultimately more money. 3. Consider purchasing locally manufactured recycling products. A recycling receptacle made in the USA not only supports local jobs and economic growth, but it also saves a tremendous amount of resources that are put into transportation, fuel and labor seen in all imports. Which is less taxing on the environment? A receptacle made in New York and shipped to New Jersey, or a receptacle made in China and then shipped across the seas. Think locally. Think greener. 4. Encourage participation by building visitors and guests. Educating building visitors with proper signage that results in a recycling participation rate as close to 100% as possible is a great way to get “Greener.” You can reduce pollution just by asking your visitors to put that recyclable in the proper bin. Top manufacturers of recycling receptacles will provide you the option to add on a customized silk screened message to your recycling receptacle. You can also add sign posts and signage to encourage recycling. Using attractive metal receptacles with the best finishes to coordinate with your areas will help attract visitors and provide them with an improved customer experience as they recycle at the same time. 5. Use recycling receptacles with individual openings for each type of recyclable. Many of us have seen (and used) the “one type fits all” recycling receptacles in which any type of recycling materials can be disposed. Many of them are made from plastic* which is harmful to the environment. However, in areas where keeping waste streams separate is required, and still different types of recyclables are mixed together, additional labor is then required to sort them later. This additional labor means more costs. If you use recycling receptacles such as Glaro Inc. connected recycling stations, single purpose units, dual purpose recycling receptacles and triple purpose recycling receptacles, then bottles, cans, paper, glass, plastic, aluminum, batteries, and waste will be sorted at the point of disposal. That saves labor and energy downstream and it is a greener way to implement a recycling program than a “one type fits all” recycling bin. In sum, when “going green,” finding practical ways to integrate a recycling program into a facility that will help preserve the environment, while saving money in the long run, is the method of choice. In the case of using recycling products as described above, the extra benefit is better value for the dollar because your dollar then lasts longer, works better, goes further, and is investing in the future of the environment. 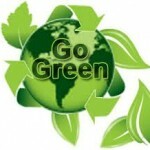 American receptacle manufacturers such as Glaro Inc. choose to produce products that support the above green strategies. Glaro Inc. incorporates the above concepts into their recycling products to do its part in manufacturing “greener” products and encourages other American manufacturers to do the same.